A pipette (also called a pipet, pipettor or chemical dropper) is a laboratory instrument used to transport a measured volume of liquid. Pipettes are commonly used in chemistry and molecular biology research as well as medical tests. Pipettes come in several designs for various purposes with differing levels of accuracy and precision, from single piece glass pipettes to more complex adjustable or electronic pipettes. A pipette works by creating a vacuum above the liquid-holding chamber and selectively releasing this vacuum to draw up and dispense liquid. Pipettes that dispense between 1 and 1000 ?l are termed micropipettes, while macropipettes dispense a greater volume of liquid. The original pipette is made of glass. It is more commonly used in chemistry, with aqueous solutions. There are two types. One type, the volumetric pipette, has a large bulb, and is calibrated for a single volume. Typical volumes are 10, 25, and 50 mL. Alternatively, Mohr pipettes are straight-walled, and graduated for different volumes such as 5 mL in 0.5 mL increments. The single volume pipette is usually more accurate, with an error of ± 0.1 or 0.2 mL. The pipette is filled by dipping the tip in the volume to be measured, and drawing up the liquid with a pipette filler past the inscribed mark. The volume is then set by releasing the vacuum using the pipette filler or a damp finger. While moving the pipette to the receiving vessel, care must be taken not to shake the pipette because the column of fluid may “bounce”. These are the most accurate and precise pipettes. They are more commonly used in biology, though they are commonly used by chemists as well. The plastic pipette tips are designed for aqueous solutions, and are not recommended for use with organic solvents which may dissolve the plastic. These pipettes operate by piston-driven air displacement. A vacuum is generated by the vertical travel of a metal or ceramic piston within an airtight sleeve. As the piston moves upward, driven by the depression of the plunger, a vacuum is created in the space left vacant by the piston. Air from the tip rises to fill the space left vacant, and the tip air is then replaced by the liquid, which is drawn up into the tip and thus available for transport and dispensing elsewhere. Sterile technique prevents liquid from coming into contact with the pipette. Instead, the liquid is drawn into and dispensed from a disposable pipette tip which is changed between transfers. Depressing the tip ejector button removes the tip, which is cast off without being handled by the operator and disposed of safely in an appropriate container. The plunger is depressed to both draw up and dispense the liquid. Normal operation consists of depressing the plunger button to the first stop while the pipette is held in the air. The tip is then submerged in the liquid to be transported and the plunger is released in a slow and even manner. This draws the liquid up into the tip. The instrument is then moved to the desired dispensing location. The plunger is again depressed to the first stop, and then to the second stop, or ‘blowout’, position. This action will fully evacuate the tip and dispense the liquid. In an adjustable pipette, the volume of liquid contained in the tip is variable; it can be changed via a dial or other mechanism, depending on the model. Some pipettes include a small window which displays the currently selected volume. Operator consistency is paramount to repeatable operation. The necessity of operator practice and development of good pipetting practices and habits is absolute. Light guided pipetting aides are used to help reduce errors and speed up liquid handling protocols. When drawing up liquid the tip should be dipped 3 to 5 mm below the surface of the liquid, always at a 90 degree angle. When dispensing the pipette should be held at a 45 degree angle, and the tip placed against the side of the receiving vessel. Glass vessels are preferred; the surface tension of the glass provides additional torsion that results in complete evacuation of the tip. The tip must never be wiped off or blotted in any way, even from the exterior, while liquid is in the tip. These actions tend to attract and thus bleed off some of the liquid, resulting in decreased accuracy and repeatability. A dry tip should always be pre-wetted by drawing up and dispensing the chosen volume a minimum of three times. This action reduces the surface tension on the inside walls of the tip and also provides the proper level of inter-tip humidity, which reduces evaporation of the sample liquid. Most pipettes are calibrated “to deliver” (TD) and not “to contain” (TC). If they are TD pipettes they should not be rinsed after they have delivered their contents. If the pipette were calibrated TC it should be rinsed to obtain the correct amount of material. If the fluid to be measured is quite viscous or sticky (such as glycerol solutions) the pipette must be calibrated and in this case the outside of the tip must be carefully wiped with a lint free tissue to remove the adhering liquid – while being careful to not touch the opening of the pipette tip, which may require some practice. Accuracy in delivering liquids with high or low viscosity may require a “positive displacement” pipettor, which is quite distinct from an air displacement pipettor. For maximum accuracy, and especially necessary when calibrating the pipette, relative humidity in the ambient environment should be maintained between 50% and 75%, and in no case should the humidity be allowed to dip below 50%. This limits the rate of sample evaporation which can cause significant errors, especially at lower volumes. Heat from the operator’s hand is absorbed through the handle of the instrument and transferred to the metallic components inside. If the pipette is operated continuously for a prolonged period of time this heat buildup becomes significant, causing the internal components to expand and changing the interplay between components. This reduces the consistency, accuracy, and repeatability of the instrument. The volume dispensed is dependent on the sizes of the piston and the springs that cause its travel. As these change in size the volume dispensed changes also. This effect is more pronounced in low-volume instruments. Additionally, the expansion of a metallic component that interacts with a non-metallic one that does not expand as readily in the presence of heat may cause the instrument to seem to stick, hang up, or react more slowly. Pipettes with thin handles are particularly susceptible to this phenomenon. Plumper handles are both more ergonomic and less likely to suffer from heat transfer problems. 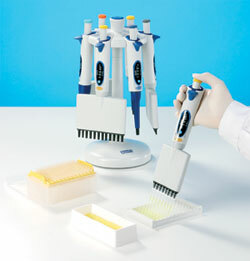 The best technique for maximum accuracy is to employ multiple pipettes and rotate them often, storing them between uses in a stand that holds them vertically. Operator fatigue is an often-overlooked but crucial component when seeking maximal accuracy and repeatability. Human beings are not robots, and repetitive motions cause stress in human joints and muscles. Even a well-trained and experienced operator will see a decrease in accuracy and repeatability as length of time on the job increases. It is for this reason that pipette calibration service providers that are dedicated to excellence limit the number of pipettes that can be calibrated by an individual technician to a maximum daily number. Each pipette, and each customer, deserves a high level of care in the treatment of the instrument. Additionally, some dedicated professionals train themselves to pipette ambidextrously, allowing them to reduce arm and finger strain by alternating hands. Another solution is choosing an electronic pipettor which significantly reduces hand fatigue. Once the operating button is touched the pipettor operates always the same way producing user independent accuracy and precision. Long-term pipette operation can lead to repetitive strain injuries (RSI), such as carpal tunnel syndrome. These disorders may cause significant reductions in accuracy and repeatability by altering the proper pipetting techniques that are crucial to achieving optimal accuracy. Preventive measures include learning to pipette with both hands and alternating their usage, taking frequent breaks while pipetting, and choosing the most ergonomic pipette available. Instruments with plumper handles are generally superior in this regard. On the other hand, electronic pipettors which operate with a light touch reduce RSI significantly. Letting the pipette “rest” for at least one minute after a volume change is made. This does not apply to single-volume instruments, also called set volume or fixed volume pipettes. A change in the dispensed volume of an adjustable pipette involves modifying the internal tensioning of a spring that governs the piston’s travel distance. Springs subjected to changing tensioning behave more smoothly and consistently when they are allowed to enjoy an interval of rest to settle into their new configuration. A pipette that is left idle for at least one minute after a volume adjustment will perform more accurately than one that is pressed into service prematurely. This is especially important when calibrating a pipette. The skill and training of the operators. Skilled operators tend to operate the instrument more correctly and make fewer accuracy-robbing mistakes. The liquid dispensed by the pipette. Corrosive and volatile liquids tend to emit vapors which ascend into the pipette shaft even under proper operating conditions and may corrode the metal piston and springs, or the seals and o-rings that provide an air-tight seal between the piston and the surrounding sleeve. Proper and careful handling. Pipettes that are frequently dropped, are subjected to careless handling or horseplay, or that are not properly stored in a vertical position, will tend to degrade in accuracy over time. The accuracy required by the instrument. Applications requiring maximum accuracy also demand more frequent calibration. Instruments used for purely research applications or in educational settings generally require less frequent calibration. Under average conditions, most pipettes can be calibrated semi-annually (every six months) and provide satisfactory performance. Institutions that are regulated by the Food and Drug Administration‘s GMP/GLP regulations generally benefit from quarterly calibration, or every three months. Critical applications may require monthly service, while research and educational institutions may need only annual service. These are general guidelines and any decision on the appropriate calibration interval should be made carefully and include considerations of the pipette in question (some are more reliable than others), the conditions under which the pipette is used, and the operators who use it. Calibration is generally accomplished through means of gravimetric analysis. This entails dispensing samples of distilled water into a receiving vessel perched atop a precision analytical balance. The density of water is a well-known constant, and thus the mass of the dispensed sample provides an accurate indication of the volume dispensed. Relative humidity, ambient temperature, and barometric pressure are factors in the accuracy of the measurement, and are usually combined in a complex formula and computed as the Z-factor. This Z-factor is then used to modify the raw mass data output of the balance and provide an adjusted and more accurate measurement. The colormetric method uses precise concentrations of colored water to affect the measurement and determine the volume dispensed. A spectrophotomer is used to measure the color difference before and after aspiration of the sample, providing a very accurate reading. This method is more expensive than the more common gravimetric method, given the cost of the colored reagents, and is recommended when optimal accuracy is required. It is also recommended for extremely low-volume pipette calibration, in the 2 microliter range, because the inherent uncertainties of the gravimetic method, performed with standard laboratory balances, becomes excessive. Properly calibrated microbalances, capable of reading in the range of micrograms (10-6 g) can also be used effectively for gravimetric analysis of low-volume micropipettes. Pasteur pipettes, also known as droppers are used to transfer small amounts of liquids, but are not graduated. Pasteur pipettes are made of plastic or glass. Transfer pipettes, are similar to Pasteur pipettes. However, they are made exclusively from plastic and their bulb can serve as the liquid-holding chamber. Serological pipettes are measuring pipettes that have graduations extending all the way to the tip. Mohr pipettes are measuring pipettes that resemble serological pipettes, with the primary difference that the graduations do not extend all the way to the tip. Dispensable pipettes are often made of plastic and intended to be used to administer medicine into the eye or ear of a patient (see image). Pipette fillers are used to fill the pipette easily, avoiding the need for mouth pipetting. Pipette helpers are battery-operated and are designed to be used with disposable pipette tubes. These pipettes cannot be calibrated and their accuracy is determined by that of the printed graduations on the disposable tubes. Light-guided pipetting systems are pipetting accessories which are computer based. They utilize flat screen LCD monitors or LED arrays to light up source and destination wells in microplates or vials for accurate well to well pipetting. Some of these systems use text to speech to alert the operator during plate or volume changes when pipetting lab protocols. Pipette tips. The pipettors and injection molded plastic disposable tips form together a reliable pipetting system. It is recommended to use original manufacturers tips to guarantee the precision and accuracy of the pipettes. The precision-made pipettor tips provide excellent reproducibility and accuracy. Pipettor tips are available in autoclavable boxes, refills and bulk packaging. Non-sterile, pre-sterilized and filtered tips are usually available in single trays as RNase, DNase and endotoxin certified free. A zeptoliter pipette has been developed at Brookhaven National Laboratory. The pipette is made of a carbon shell, within which is an alloy of gold-germanium alloy. The pipette was used to learn about how crystallization takes place. Aimee Cunningham (2007-04-18). “A New Low: Lilliputian pipette releases tiniest drops“, Science News, pp. 244-245. Portions of this article are from “Pipette. In Wikipedia, the free encyclopedia. Retrieved September 16, 2008, from http://en.wikipedia.org/wiki/Pipette.” This article has been reviewed for scientific accuracy and is used in accordance with Wikipedia’s GNU Free Documentation License (GFDL).